Roulette is a casino table game, which consists of a ball, a wheel, and some numbers. If you are good with numbers, you can expect to beat the game and win more money through your roulette betting. However, beating a casino at a roulette table is not an easy task. It is something that takes a lot of skill and maybe some luck, but skill is the most important thing. So, how do you acquire the skill of figuring out roulette numbers? The process of predicting numbers in a roulette game involves predicting the pocket numbers where the ball might fall in a particular spin. The aim is to overcome the casino house edges. There are two major types of roulette wheels – American double-zero wheel in which the house edge is 5.26 percent and the European single-zero wheel in which the house edge is 2.7 percent. Let’s find out some ways to make predictions of numbers in roulette. The prediction of the winning number in a roulette game depends largely on the end speed of the ball before it stops, which is usually the same in every spin. The game result is, therefore, not much affected by things like how fast or slow a dealer spins the wheel as the end speed of the ball will always be the same. 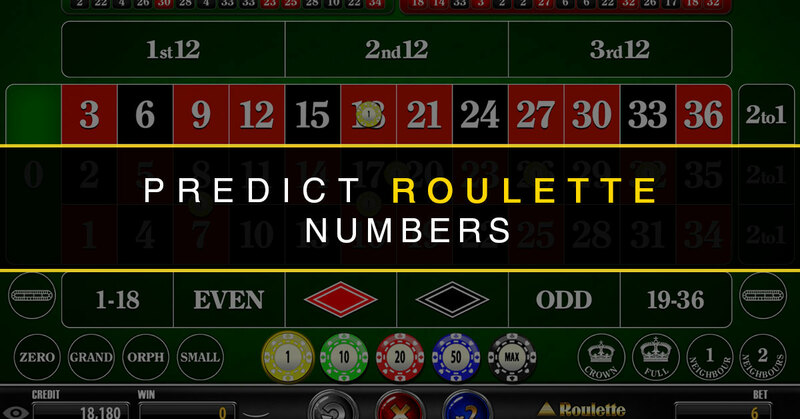 Here are some of the most effective ways of figuring out winning number in a roulette spin. Every dealer has a specific signature. Some dealers can hit a specific section of the wheel more than others, while some other dealers favour odd numbers more than even numbers. The idea is to find the signature of a particular dealer and use it to get an edge in the game. In theory, this system actually works and can help you predict the upcoming numbers, however, its practical application is not that easy. Even the dealers believe that it isn’t actually possible to control or even predict where the ball will stop on the wheel. Then there are situations where even the dealer is not aware of a specific move he/she is making. For example, if a dealer always follows the same method of spinning the ball around the wheel, there builds a rhythm in the output numbers. You can try predicting that system in order to get an edge in the game. Is it possible for a player to figure out the upcoming number on roulette wheel by analyzing the movement of the ball on the wheel? This method was quite popular in the 1990’s but hasn’t worked much since. Even though the visual prediction method doesn’t usually work, many roulette players are not reluctant to give it a try. However, it is not easy to predict a number or the place where the ball might drop by just analysing its spinning speed and the speed of the wheel. Here’s a better way to do it. In order to be able to make better predictions, you need to analyse the ball speed and movement to know approximately how many bounces it takes in each pocket and in which direction. Based on that, you should try to figure out the numbers in the section where the ball is likely to land. Then, you can bet on those numbers. Of course, it sounds like an almost impossible job and it is quite difficult to make the right prediction. This is why it is called gambling. Use of pocket computers or any other digital equipment to alter the outcome of a casino game is considered outright illegal by the casinos and might even lead to jail. So, you will have to be very careful if you are planning to use a roulette computer. A roulette computer is a tool that helps you predict the winning number by calculating the speed of the ball at the end of the track. It is based on the idea that the ball’s speed is usually the same every time it is at the end of the track. The tool also analyzes the angle at which the ball descends and then makes a prediction for the pocket in which the ball is most likely to fall. Basically, it does everything a player needs to do manually in the method two mentioned above. Remember that even this method cannot predict the exact landing zone of the ball. This is not a very common mechanism these days, as the prediction on biased wheels completely depended on the fact that there existed biased or off wheels. This mechanism was specifically successful in the old days when mechanical wheels were used in roulette. Back then it was possible to find a wheel that was not working properly and showing a specific number or series of numbers more frequently than others. However, it is not much seen in today’s computerized roulette games where there are no biased wheels. So, does this method really work? It sure does, but unfortunately, you will not find many casinos with such type of roulette wheels. Still, if you somehow manage to find a biased wheel in a casino that is giving up some numbers more frequently, there is no harm in trying it.